Elworthy Cottage and Shepherds Hut in Salcombe sleeps 6 people. Elworthy Cottage in Salcombe is a seventeenth century, listed, thatched cottage partly hidden in a wooded dell some fifteen minutes, principally level, walk to Salcombe beside the beautiful Batson Creek. Elworthy Cottage in Salcombe, which sleeps 4, has been tastefully refurbished and decorated to provide comfortable accommodation, has ample parking and lawned, secluded gardens. Situated to the rear of the cottage, The Shepherd’s Hut, which sleeps 2, can be booked in addition at an extra charge. Parking, gateway and path through garden. Front door to Kitchen/Diner: tiled worktops, table and chairs, electric oven and hob, microwave, fridge, freezer, dishwasher. 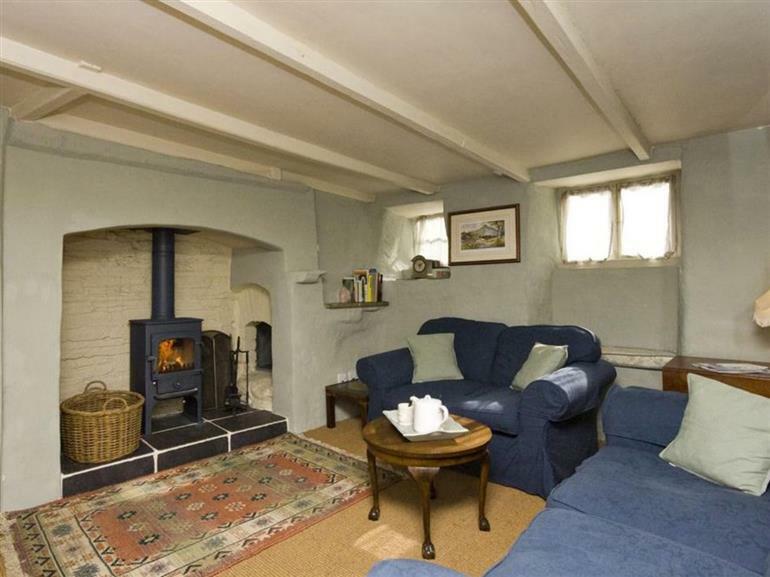 Sitting Room: partly beamed, feature fireplace with ’bakers’ oven’. Newly fitted Wood burner, music system, TV, DVD, door to garden. Hallway: tiled floor. Wet Room: shower, basin, WC. Stairs to First floor. Bedroom 1: king-size bed (5’), painted beams, basin. Bedroom 2: twin beds, basin. Outside: lawns on three sides, trees and shrubs. Utility room with washing machine and tumble dryer. Outside furniture. Bar-be-que. Footpath to Batson through woodland. Please note: Children are not permitted access to upper lawn level. The Shepherd’s Hut comprises a small double bed, wood burner, WC and sink (cold water only). Hot water and heating by electric night storage. One well behaved dog welcome (but not to be allowed upstairs or on the furniture) at the owners discretion and an additional £25 per week. Please note that Elworthy Cottage in Salcombe sleeps a maximum of 4 adults. Holidays at Elworthy Cottage and Shepherds Hut run from Saturday to Saturday. Pets allowed at Elworthy Cottage and Shepherds Hut. For a better idea of where Elworthy Cottage and Shepherds Hut - Sleeps 4/6 is, you can see Elworthy Cottage and Shepherds Hut - Sleeps 4/6 on the map below. 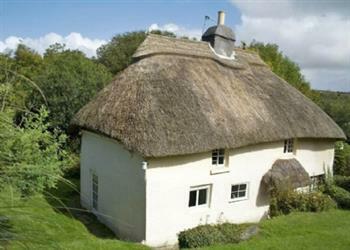 Elworthy Cottage and Shepherds Hut - Sleeps 4/6 is in Devon; should you be on the lookout for a special offer, you can find all the special offers in Devon. It's always worth checking to see what is on offer at the moment. Do you want to holiday near Elworthy Cottage and Shepherds Hut - Sleeps 4/6 (SHELWOR), you can see other cottages within 25 miles of Elworthy Cottage and Shepherds Hut - Sleeps 4/6; have a look to find your perfect holiday location.